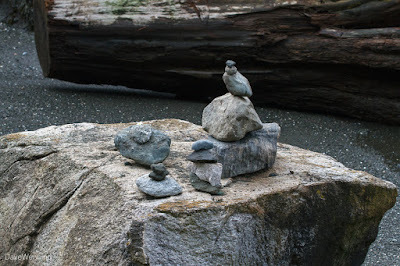 Back in March of 2015, I found these beautifully constructed cairns on the beach at Lighthouse Point in Deception Pass State Park. Lighthouse and Lotte Points are the grassy stone outcrops that can be seen from the Deception Pass Bridge looking west. The Lighthouse Point Trail runs from Bowman Bay to the shore of Deception Pass. As I always say, when you go hiking, you never know what you might find. Humans have been piling stones for various reasons since prehistory. The Vikings built stone altars called Hörgar. The word cairn comes from Scots Gaelic càrn (plural càirn). The ancient Celts built cairns to mark important places or events or to commemorate the graves of loved ones and important people. The Arabic word rujm (رجم) appears in place names and refers to piles of stones. In the Sinai Desert, stone piles or altars are thought by some to mark the path of the ancient Israelites in their exodus from Egypt. The route for this year's First Day Hike at Deception Pass State Park has been announced. 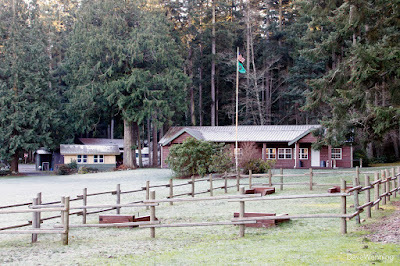 Starting at the Cornet Bay Retreat Center (above), the route will take us around the Goose Rock Perimeter Trail, up and over the summit, then back to the Retreat Center. At the end of the hike, Jeff Kish from the Pacific Northwest Trail Association will present "Experience the Pacific Northwest Trail." This 1,200 mile scenic hiking trail extends from Glacier National Park in Montana to the Pacific Coast of Washington's Olympic Peninsula. The First Day Hike will include a part of it which passes through Deception Pass State Park. After being shut up in the house for more than a week by the weather, I was itching to get outside. Christmas Day delivered clear skies and sunshine, so I decided to preview the route for this year's hike. There is a brand new trail in Deception Pass State Park called the Big Cedar Trail. 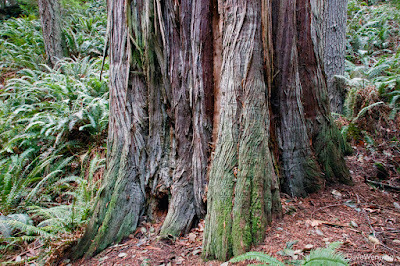 The photo shows just the base of its namesake, a Western Redcedar, Thuja plicata. I find it is difficult to portray the size of a big tree in photos. Without a person standing next to it for reference, it could be run-of-the-mill. Let me say, if a six foot man was added to the photo, he would easily fit in the frame. The tree is 8 feet (2.4 m) in diameter and 26 feet (8 m) in circumference at shoulder height. It is truly a very big tree. This past summer, I recall seeing a line of ribbons tied to shrubs heading off the left side of the Ginnett trail. I wondered if something like this was planned. We can thank the volunteers of SWITMO (Skagit-Whatcom-Island Trail Maintaining Organization) for clearing and cutting the new trail. Anyone hiking it will appreciate the labor that was required.